Project MARCH took the first steps with their new exoskeleton, the MARCH II. Yesterday, after a whole year spent designing, developing and building, the student team finally revealed the assistive robotic system to the outside world. Ruben de Sain (himself a paraplegic and team pilot), took the first official steps. Project MARCH hopes that this new advance in medical technology will enable paraplegics to resume their normal day-to-day activities. The exoskeleton shows that paraplegics can walk again. Using it has huge benefits for the user’s physical and mental well-being. “Being able to walk is good for general mental and physical fitness, and has a positive effect on the added complications of paraplegia, such as cystitis and bowel problems,” says Ilse van Nes, rehabilitation doctor at Sint Maartenskliniek, where Ruben de Sain underwent a rehab programme that used a commercial exoskeleton. For users, an exoskeleton is much more than a technological device that ‘restores’ leg function. “The fact that after 10 years, you can stand up and talk to your family and friends at eye level is such an amazing feeling”, explains Ruben. The 31 students started their design for a totally new user-friendly exoskeleton a year ago. “We are delighted that it works, and I’m so proud of the team and Ruben for everything we’ve accomplished so far. Now that the first steps have become a reality, we can officially start the intensive training programme for the Cybathlon Experience,” says Donald Dingemanse, team manager of Project MARCH. The Cybathlon Experience, held in October, is a competition for bionic para-athletes, in which they use exoskeletons supplied by commercial and academic teams to complete the four elements of the event in the fastest time. The elements are designed to represent everyday situations. 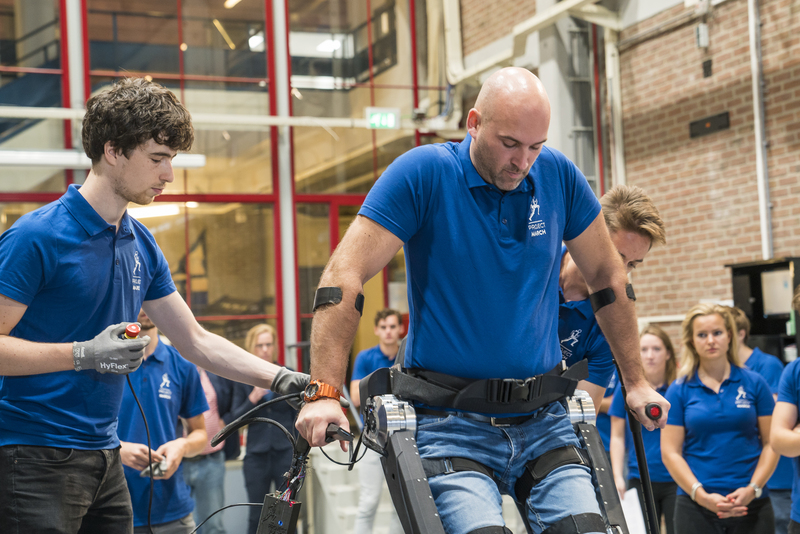 “Alongside the competitive element, this competition is also an important opportunity for the teams to test the suitability of their exoskeletons in day-to-day situations and swap knowledge and experiences. We hope that together, we can give an extra boost to the developments in this branch of medical technology,” concludes Dingemanse.